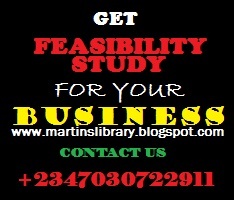 Dear reader, first of all you need to understand what a feasibility study and business plan is all about. The very short meaning is material/funds/knowledge required to start a new business or upgrade an already existing business. Know this; a Bank Facility or YouWin Competition Programme can never give you or your company a loan (grant) or (free investment money in the case of YouWin) if you cannot give an official account and well detailed explanation by writing what you are using the money for. There are several ways of writing a business plan which must contain a well detailed feasibility study depending on the type of business or production a company is into. Please Read About Us Here - This is for You to Know who we are!!! Before you go into that business or apply for YouWin with the idea of that in your mind or you want to makeup from the mistake you have already done by diving into a business without prior knowledge of it, this is the best opportunity for you. You can become a YouWin winner of N10million Naira (Nigerian currency) if you choose follow the instructions we will give you. What you need is to get a professional and comprehensive business plan/feasibility study for your production company and sales business from us here in Martins Library. The business plan and feasibility study will cover all you need to know about in setting up a production company or any type of business. It will explain the procedures and process of production, marketing ideas, costing of equipments, exact capital needed, profit within a period of 3-5yrs etc. Other Details not mentioned here will also be included. Its market need/social problem its address. Is the product or service feasible? How to bring this ideal to live? Bar chart representation of the projection. All you need to do right now is to Contact Us via our email or phone number, have a discussion with us to indicate your interest and we will do the rest of the work for you by compiling and arranging a business plan and feasibility study containing the amount you will need to invest in any type of business or expanding the one you already have using the cash flow profit. When we are done, we will send it to you through your email. When you receive it, you can then submit it to the bank if need be (this is for those who need a loan/grant from a bank), or use it to answer all YouWin questions by filling the information in the business plan on YouWin website (www.youwin.org.ng), or use the information and implement it in your business (if you are not getting a loan from anybody) and see good results. These are some prerequisite needed to prepare a business plan and feasibility study for you; this is the information we will need from you to be able to write a feasibility study. 13. The years of experience you have for that business (if any). After payment, send your payment details (Payee name, telephone number, teller no and email address) to our email; martinslibrary1@gmail.com or phone number +2347030722911 for verification. (please specify the level of the work [e.g Business Plan and Feasibility Study type - palm oil business, poultry business, clothing and textile production, web based business, recharge card business, crude oil production, cassava production, fishery, etc]. We work from Mondays to Fridays (8am-4pm) and we have gathered thousands of materials from different sources both local and international. We keep our word to the later & deliver our products and services (i.e Material to the specified topic you sent us) in a good & tested working conditions. We would return your payment with 48hrs ONLY if you can prove with concrete reasons that the business plan and feasibility study materials we sent you is not relevant/elaborate enough on the type of business type or topic you sent to us. At Martins Library, We provide Informative Materials for Writing Books, Projects, Seminars, Journals, Articles, Proposals, Feasibility Study Etc For Business And Educational Purposes. We also teach you how to print recharge card from the comfort of your home or office. Your success in your business is our optimum desire and WE DON'T DO FRAUD, we deliver for the services you pay for. We want to serve you better and hope to hear from you soon. Once again, thanks for your interest, we expect your patronage. 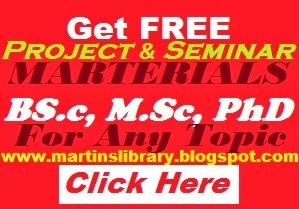 At Martins Library, We provide Informative Materials for Writing Books, Projects, Seminars, Journals, Articles, Proposals, Feasibility Study Etc For Business And Educational Purposes. 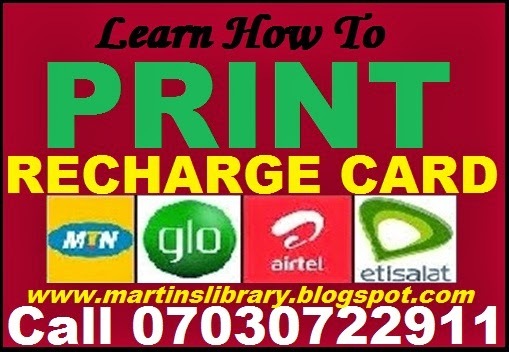 We also Teach you How to Print Recharge card from the comfort of your home or office. Click on the related links below and read more. We can keep you updated on this information, please Subscribe for Free by entering your email address in the space provided.